Need expert advice. I plan to change 2 tyres for WagonR LXI(power steering, 2003 model) due to issues with wear n tear(cut on sidewall). Current tyre size is bridgestone TubeType 145/70R13. 2- I am also want that tyres should be low noiseable, better comfort, and better handling. 3- Change 2 tyres. In that case,would like to know where to mount the tyres(Front or Rear Axle). Hope I am able to explain my requirements fully. Please let me know in case any other info is required. I am working with car dealer and i can suggest you some nice option which you can try. But first of all make sure you understand the car tyre size. .
Tyres have a code system etched into their sidewall, which allows you to understand their technical capabilities. Section Width: It’s the width of the tyre in millimetres. Aspect Ratio (Profile): It is the ratio of the tyre's width to height, as a percentage. What Should You Know: Normally a low profile tyre (short sidewall vs width) gives a firmer ride with better handling, but tends to be noisier and more expensive than tyres with a higher aspect ratio. Rim Diameter: The diameter of the rim is basically which the tyre is to be fitted to, in inches. 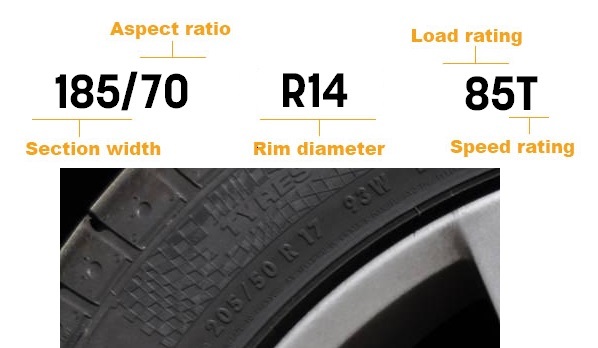 Load Rating: Indicates the maximum load that each tyre can support. So for WagonR LXI Here are the recommend sizes. Last edited by stevenson7869; 02-03-2015 at 02:02 AM.